This Hubble Space Telescope photo of Messier 74 reminds us that spiral galaxies are some of the most beautiful and photogenic residents of the universe. 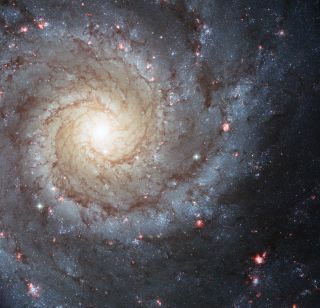 Nearly 70 percent of the galaxies closest to the Milky Way are spirals. New research finds that spiral arms are self-perpetuating, persistent, and surprisingly long lived. Image released April 2, 2013. Spiral galaxies are twisted collections of stars and gas that often have beautiful shapes and are made up of hot young stars. Most of the galaxies that scientists have discovered so far are spiral galaxies, as opposed to the other two main categories of galaxy shapes — elliptical and irregular. The Milky Way – the galaxy that includes Earth and our solar system – is an example of a spiral galaxy. Spiral galaxies make up roughly 72 percent of the galaxies that scientists have observed, according to a 2010 Hubble Space Telescope survey. Most spiral galaxies contain a central bulge surrounded by a flat, rotating disk of stars. The bulge in the center is made up of older, dimmer stars, and is thought to contain a supermassive black hole. Approximately two-thirds of spiral galaxies also contain a bar structure through their center, as does the Milky Way. The disk of stars orbiting the bulge separates into arms that circle the galaxy. These spiral arms contain a wealth of gas and dust and younger stars that shine brightly before their quick demise. How the spiral arms form continues to puzzle scientists. One theory suggests the galaxy arms could be the result of density waves traveling through the outer disk. Encounters between galaxies could cause such waves as the mass of the smaller galaxy could affect the structure of the larger galaxy as the two combine. Spiral galaxies are thought to evolve into elliptical galaxies as the spirals get older. But it's unclear how common elliptical galaxies are as they're made up of older, dimmer stars, and are more challenging to spot. One of the largest known spiral galaxies is NGC 6872, which is 522,000 light-years across from the tips of its outstretched spiral arms — that's about 5 times the size of the Milky Way. In 2017, astronomers discovered an 11-billion-year-old ancient spiral galaxy called A1689B11. Its discovery will help scientists understand how galaxies transition from "highly chaotic, turbulent discs" to more organized and thinner discs, like that of the Milky Way. This article was updated on Nov. 19, 2018 by Space.com Contributor, Elizabeth Howell.